As of this month, Jack Kirby has been gone form this world for 19 years. Whenever the name Jack Kirby is invoked, strong feelings inevitably follow. They’re almost universally positive in nature, though there is also a large segment that gets up in arms over the treatment of their hero at the hands of publishers. I’ve done some reading on the man they called The King, but I’m far from an expert. What I do know is that his impact on comics is massive, both in scope and quantity and his seemingly limitless imagination fueled it all, along with his deep devotion to his family and his desire to provide for them. From all I’ve gathered, he was a most remarkable human being on top of his artistic abilities. I did a little research on his prodigious output in preparation for this piece and not surprisingly found scads of credits. While some were of the reprint variety and foreign editions of his work, it was still staggering. The list of publishers alone is incredible: Hillman, Fox, Fiction House, Harvey, Prize, Pacific, Archie, Charlton, Mainline, Topps, Fawcett, Eclipse and needless to say, the Big Two. Somehow, despite all the work he did for the other guys, which probably accounts for the one missing decade, Jack was seen in the pages of DC Comics’ magazines in the 1940’s (and by the way, he was in the industry from the very beginning, with credits in the ‘30’s), the 1950’s, the 1970’s and the 1980’s with such offerings as the Boy Commandos, Sandman, Atlas, Manhunter, Dingbats of Danger Street, Green Arrow, Mister Miracle, OMAC, the Demon, the Newsboy Legion and the Guardian, Justice, Inc., Forever People, The Losers, Kamandi, Jimmy Olsen, Richard Dragon – Kung Fu Fighter and to my surprise a couple of pages in All Star on the Justice Society of America. A further surprise was a few stints on Captain Marvel for Fawcett. Jack really got around and must have gone through more pencils than all the P.S. elementary schools in the boroughs of New York. He did war books, superheroes (big surprise there), crime, mystery, a pioneer in romance books, adventure, western and probably others I don’t know about. 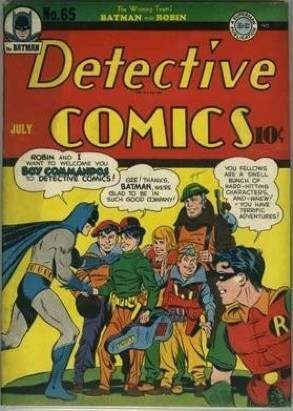 One final surprise for me was that he penciled the cover to Detective Comics #65 where Batman and Robin meet the Boy Commandos. Others inked the figures, but Jack did the pencils. Color me impressed. The one book I’ve not yet mentioned is the Challengers of the Unknown and they are the focus of this edition of the Silver Age Sage. As I’d noted before, they were the first team in the Silver Age and some have even speculated that they were a precursor of sorts to the Fantastic Four. I’ll leave that for others to decide as we take a peek at Showcase #7 from March/April of 1957. 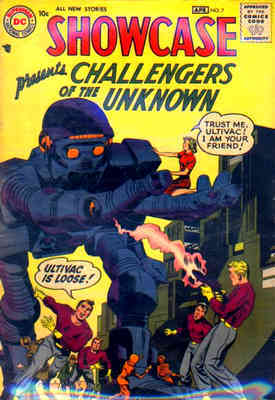 It was the second appearance of the Challs, who had their debut in the prior issue and “Ultivac is Loose!” was written by Dave Wood with art, both cover and interior by Jack Kirby. Things begin with a reintroduction of the men who live on borrowed time, beginning with test pilot Ace Morgan, then, oddly, a screw-up as Prof Haley has inexplicably become Prof Harrison, undersea explorer; adventurer Red Ryan and finally champion wrestler Rocky Davis. The Challengers of the Unknown are gathered to decide on their next mission when it comes to them in the form of a bald German named Felix Hesse. Hesse had been a scientist employed by the Third Reich, but while serving his prison sentence after the war he shared a cell with an ambitious man named Floyd Barker, a bank robber. Barker proposed they team up once they finish their sentence and soon they were hard at work on a huge calculating machine. A little pandemonium ensues as the hand grabs Hesse and the massive robot takes flight with the Challengers ineffectively firing rifle shots at the ascending machine or looking on helplessly. Apparently their mission is now clear: Find Ultivac. Chapter Two is titled, “A Challenger Must Die!” The team has gone to visit a sophisticated laboratory in Washington, D.C. to speak with a subject matter expert on robots and calculating machines, Director Robbins. Dr. Robbins explains that it’s very likely the radioactive materials used in constructing Ultivac have created an artificial intelligence, greater than man. She then feeds data into her own machine and it ejects a punch card stating that Ultivac will fall when a Challenger dies. Meanwhile, back at Ultivac’s lair, the robot is busily constructing robot doubles of Felix Hesse to go forth and collect the materials needed. The authorities, however, have issued circulars with Hesse’s likeness on them as someone to be arrested or captured. When one of the doubles is encountered, the robot Hesse is able to activate a device that causes it to disappear. Back in Washington, Red and the Director get a lead on one of the bogus Hesse’s and seek out the double. They clandestinely follow to an isolated airfield and stow away on board a helicopter piloted by the false Felix Hesse. The flight ends in a crater and upon disembarking, Red and Dr. Robbins encounter the real Hesse and Floyd Barker, who explain they are under Ultivac’s control and are essentially used for potential repairs. Ultivac then makes himself known by mentally entering Red’s head and telling him he can read thoughts and bring him into submission. Ultivac appears and explains that he won’t harm them, but cannot allow them to leave. He then picks up June Robbins as he senses no fear in her. While the massive automaton is distracted, Red strikes a power unit with a steel bar. June is released and Chapter Two closes. 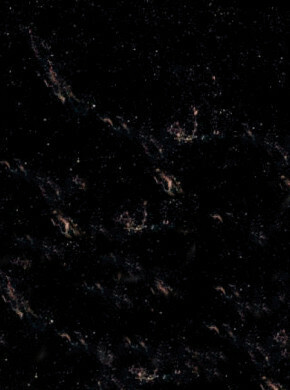 Chapter Three is “The Fearful Millions,” and the quartet flees the cavern with Ultivac in pursuit. Hesse, however, draws a concealed pistol-like weapon that drops the huge robot in its tracks. An argument follows as Dr. Robbins pleads for Government control of Ultivac while Hesse and Barker are intent on using it for profit. Soon Ultivac is on display at Yankee stadium to a paying audience, but the robot is using its mental probe to find June Robbins and to plead for help. Dr. Robbins tries to get Hesse and Barker to release their creation, but is refused and Ultivac breaks free and scoops up June as he strides through New York City. Fortunately, the massive figure doesn’t decide to climb a nearby skyscraper, but fighter planes are dispatched and begin to assail Ultivac until Ace Morgan arrives in his own jet and calls for the other pilots to stand down. Morgan asks Ultivac to similarly stand down and release June, but he cites his trust in her and refuses, issuing a powerful vibration beam that effectively disintegrates Morgan’s plane, forcing him to bail out. Ultivac next heads for the depths of the sea with June being sustained inside his head. This looks like a job for Prof (Haley) Harrison’s skill set. The good prof is soon pursuing Ultivac when a vibro beam strikes him, closing Chapter Three. The final chapter is “The Fatal Prediction!” Prof revives inside a cavern and discovers June is with him. She says that if they would just take the time to earn Ultivac’s trust, his intellect could benefit humanity. Elsewhere in the cavern, Ultivac has erected a steel door and can be heard doing work behind it. The pair then see the robot taking flight from an observation port. Ultivac’s movements are tracked by the military and the remaining Challengers wait for him as he emerges onto an east coast beach. The attack begins with machine gunfire from Red, followed by placement of a magnetically attached explosive by Rocky that destroys the robot…or so it seems. Back at the cavern the scene is being monitored by Ultivac, Prof and June and the robot declares that mankind only wishes his destruction and this proves it. He vows to wage his own war against mankind, but June pleads for him to reconsider. He is swayed and promises to seek a peaceful resolution, but vows to be on his guard. A public hearing ensues and Ultivac offers his services to the betterment of mankind if they will meet him halfway, but Barker and Hesse are determined to keep their property. The Challs declare them unfit to deal with the robot and Hesse draws a weapon that he fires at Ultivac. Rocky leaps at Hesse to subdue him, but suffers a gunshot in the process. The Challenger is rushed off for emergency surgery, but they lose him, fulfilling the prediction that Ultivac would fall when a Challenger dies. June volunteers to fill his place with the team, but then the surgeon informs them that they were able to bring Rocky back. In the final panel, the “remains” of Ultivac are shown being put to good use in the Director’s laboratory. While Ultivac’s artificial intelligence was lost, his components are still of use in man’s search for knowledge. I suspect that Ultivac was a take on Univac, the first computer produced back in the day, but of course Univac didn’t fly or make off with damsels, even when they’ve got PhD’s. Kirby could really draw the machinery and it was a good fit for him to conceive Ultivac and propel this adventure with his powerful and imaginative pictures. They didn’t call him “King” for nothing, and I’ll rate this adventure with an 8 on the 10-point scale as a strong follow-up to the Challs origins and a big step toward cementing their future. It is again our pleasure to host you, dear reader. The Silver Age of DC Comics is our playground and the webmaster and I encourage you to look around and learn along with us and to provide your own contributions through your feedback and questions. I can always be reached at my handy e-mail: professor_the@hotmail.com.